﻿ What Is Story Structure? Now, most writers are not story theorists, and don’t want to be. Still, an understanding of the way stories work can help support a writer’s instincts to make sure a flawed structure won’t get in the way of the creativity. So what is story structure? It is a map of the way people go about solving different kinds of problems, and a message by the author as to which methods are better than others. Where did story structure come from? Well, for thirty thousand years or so we’ve been telling stories, but nobody every really invented story structure. Rather, story structure just kind of emerged as a byproduct of the effort to describe how individuals deal with problems and how they interact with others when dealing with problems that affect more than one person. Story structure first appeared as the conventions of storytelling - certain truisms about the way people think and feel and they behave with one other. These truisms might not have covered every real world situation, but they were useful enough as general guidelines for crafting a story that would feel real to readers or audience members and make a clear point about personal choices and behavior in general. Now a lot of writers wanted something a little more tangible - something they could rely on as a framework for a story that really worked. In addition, a few theorist-types like Aristotle, Jung and Campbell, were interested in seeing if there was some sort of common thread in structure, perhaps an overarching perspective in which it all made sense, or at the very least a way of better connecting what was going on in stories with real life issues and how people dealt (or even should deal) with them. I have my own take on what story structure is. I believe it is about the conflicts that occur between an individual trying to do the best for himself and what his role in society demands of him. This larger role could be as simple as what a dear friend really needs, what a child needs to be happy, or what a nation asks of its ruler. 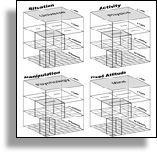 Some twenty-five years ago, Chris Huntley and I developed our own model of story structure based on one new idea no one had ever proposed before called the Story Mind - as if the story itself had its own psychology, in which every character represents a facet of that larger group mind. In our research we came to believe that every individual has certain common traits we all share, such as Reason and Skepticism. And we use them all to try and solve our personal problems. But when we gather together in groups to solves problems of common concern, we begin to specialize so that one person emerges as the Voice of Reason for the group, and another comes to be the group’s resident Skeptic. In this way, the group can get greater depth or resolution on how to go about solving complex problems that if all the members worked as general practitioners, all trying to do all the jobs, each and every one. It was our feeling this sort of thing naturally occurs whenever we gather toward a common purpose because, in a sense, it is a good survival trait for the group as a whole, and therefore for everyone in that group. Well, there’s a lot more to our theory of story structure than that, but armed with this initial breakthrough concept, we spent about three years trying to build a model of story structure. And the end result for an interactive model off all the different kinds of traits we all share, both large and very small. Those, we felt, were the elements of structure, and we created a kind of periodic table of story structure to show their dramatic properties and how they all related to one another. And beyond that, we discovered that there were dynamics built right into the conventions of story structure that could only be seen if you looked at it as a Story Mind. We catalogued those and how the whole structure was really a very flexible affair in which truisms were no longer needed because you could create very specific structures for just about any issue you might like to explore as an author. Eventually, we converted those relationships into a software-based Story Engine in which you could make choices about the kinds of you wanted to put forth in your story, and the Story Engine would actually be able to determine the ramifications of each choice on the other dramatics in your story. And ultimately, we used it as the heart of a new story structuring software product called Dramatica. We got a patent for it, in fact! I was very proud. Now, if you own the Dramatica software, you’ve probably noticed it comes with a flat chart called the “Theme Browser” that shows how dramatic subjects relate to one another. Though it isn’t in the software, there is also a 3D projection of the flat chart that looks something like a Rubik’s Cube on steroids, or a super-complex 3-D chess board. You can download a free copy of it in PDF. The flat chart provides a map of the elements that make up stories and the 3D chart is the best way to understand the "winding up" process of dramatic tension of your story. Essentially, when you run into troubles in life, you try one kind of a solution after another - one different item in the flat chart after another until you find one that works. In the 3D chart, this is like moving the dramatic element around Rubik’s Cube style. Whenever you try one solution instead of another, you not only bring the new one to the front but simultaneously push the old one into the background or onto the back burner. In the 3D chart, we call that “flipping and rotating” because sometimes you flips positions of dramatic items and other times you rotate them to change the order in which they are applied. After all, some problems are caused by using the wrong process and other problems are caused by using the right processes but in the wrong sequence. The Story Engine at the heart of the Dramatica software tracks all of those elements to make sure no dramatic "rules" are broken. What’s a Dramatic Rule? As an analogy, you can twist and turn a Rubik’s Cube, but you can’t pluck one of the little cubes out of it and swap it’s position with another little cube. In other words, you can create all kinds of patterns, but you can’t break structure. Similarly in stories, you can create all kinds of dramatic patterns, but you can’t just drop story elements wherever you want - they have to MOVE into place. When you answer questions about your story in Dramatica, you are expressing your dramatic intent - the dramatic pattern you want to create for your audience. That says something about the final arrangement you want with some of the "colors" in the Rubik’s Cube of your story. Every time you make a choice, you are saying, "I want my story to look like this, as opposed to that." You are choosing just as much what you DON’T want in your story as what you do. The choices are cumulative - they pile up. The more you make, the more Dramatica’s Story Engine winds up. Your future choices start to become limited, not by arbitrary and rigid rules, but because you can’t do everything at one time in one place. Some choices or combination of choices simply prevent other options from being possible in that particular story. Imagine - what would happen if you put anything you wanted into a story? Then anything goes. That means there is no good structure or bad structure, in fact there would be no structure at all. What is structure? Structure is nothing more than making a point, either logistically or emotionally or both. Many stories don’t need structure because they are not about making a larger point or having a message, but are designed to be experiences without any greater overall meaning. We call experiential structures “Tales” and greater meaning structures “Stories.” So, if you have an unbroken chain of events that makes sense coupled with a series of emotional experiences that don’t violate the way people really feel, that’s all you need to have a complete Tale structure. But, to have a complete Story structure, each event and experience is part of an overall pattern that becomes clear by the time the story is over. There is nothing better or worse about a Tale compared to a Story, but authors of Stories take upon themselves a more demanding rigor. Historically, it has been easy to miss a step in the events of a tale or a beat in the emotional journey. And, it has been even harder to ensure that each of those dramatic moment contributes to the greater meaning in a story. That’s why Dramatica’s Story Engine was built - not to inspire or help you build your story’s world per se, but to ensure that whatever you want to write about, and whether you want to tell it as a tale or a story, the underlying structure will be sound, complete, and tuned to just the message you want to convey to your readers or audience. You can try out the Story Engine for free! The demo version of Dramatica is fully functional, other than saving your work. So if you want to try some of the questions and play around with the other tools, you can download the demo here and get everything the Story Engine has to offer except for saving your work to continue with it in later sessions. Honestly, you may find Dramatica a little daunting, as it is extremely powerful and wide ranging with all kinds of features and functions. And, it is built on our theory of story structure, which (though elegant) is also extensive and detailed. So if you try it and get lost, just email me, and I’ll walk you through it - no charge, just because I’m a teacher and I like to teach. My feelings, everything you learn in Dramatica is one more way you have improved your ability to visualize and actualize your story. So, my advice is to give it a try for free. All you have to lose is a little itsy bitsy bit of time, but what you have to gain is a much deeper and powerful understanding of story.